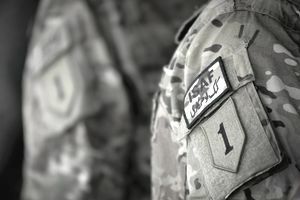 The Army has patches it uses to signify which command or unit a soldier is serving with, both overseas in combat deployments and back in garrison in their permanent duty station. These patches signify both currently attached units a soldier serves on the left sleeve, as well as the prior unit attached to while serving in a combat zone for a specified period of time on the right. Obviously, not everyone wears a combat patch on his or her right arm, so these are proud displays of prior service for the soldier. The Army combat patch, officially known as the "shoulder sleeve insignia-former wartime service" (SSI-FWTS), recognizes soldiers' participation in combat operations. The Army has specific guidelines on when and how to wear the patch, which it has revised to reflect the fact that soldiers now are deployed at smaller echelon levels. After 1945, only soldiers who were serving with large echelon deployed units, such as separate brigades, divisions, corps, Army commands, or higher, were eligible to wear the combat patch. The smaller support companies/battalions and other lower-ranking units had their own combat patches. Once soldiers report to their first units, they should wear their command's combat patch on their left sleeves. When deployed to a designated combat zone, soldiers also may wear the company-level or higher patch on their right sleeves to reflect the units in which they serve. The right sleeve is used to signify what unit you were deployed into combat zones with; thus, it is called the Combat Patch. The left sleeve unit patch denotes what unit you are currently serving with. The guidance states that when echelons below company level deploy, soldiers in those units may now wear the combat patch of the lowest-echelon command they deploy with, as long as it's at company level or higher. In order to be eligible for the combat patch, soldiers must be serving in a theater or an area of operation that has been designated a hostile environment or serving during a war period as declared by Congress. The units "must have actively participated in or supported ground combat operations against hostile forces in which they were exposed to the threat of enemy action or fire, either directly or indirectly," according to the regulations. The military operation also must have lasted for 30 days or longer, although exceptions can be made to this rule. Army personnel who served in a designated area as civilians or as a members of another service who were not members of the Army during one of the specified periods are not authorized to wear the combat patch. Finally, soldiers who have earned multiple combat patches may choose which patch to wear. Soldiers may also elect not to wear a combat patch. These combat patches are sources of pride for an Army war veteran. However, if you are assigned to a new command, often you will wear that command patch when stateside to have a uniform appearance, like that of your new soldiers. The Class A Uniforms require full-color detail of patches earned on your sleeves. When in the field, the same patches will be worn but they will be subdued color (green, black, brown) with no bright colors, which could potentially give away your position.